This past Sunday morning, I drove 110 miles to photograph a sunflower field on a farm in Maryland at sunrise. I am very thankful to the owner of the farm, who had planted the sunflowers and who invited me to the farm to photograph them. I was warned that the sunflowers were beginning to wilt and had passed their peak bloom, but only by a few days. 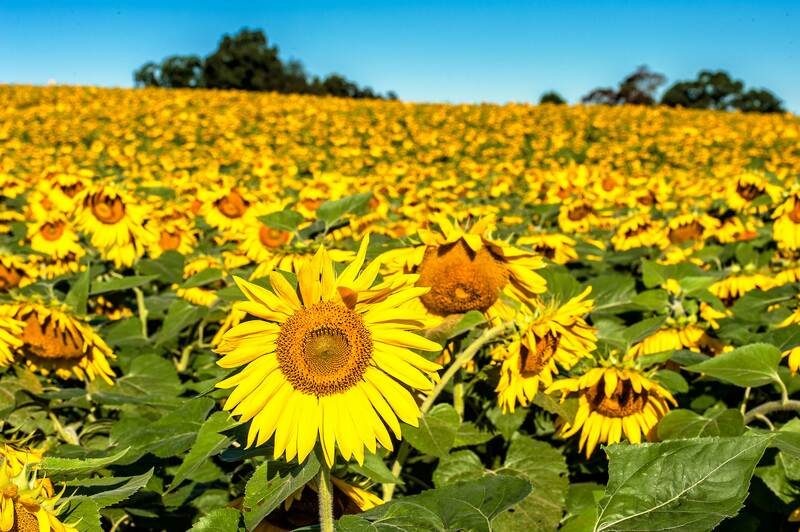 I was concerned about missing the peak bloom, as well as the damage the sunflowers might incur as a result of severe thunderstorms that were passing over Maryland Saturday evening. 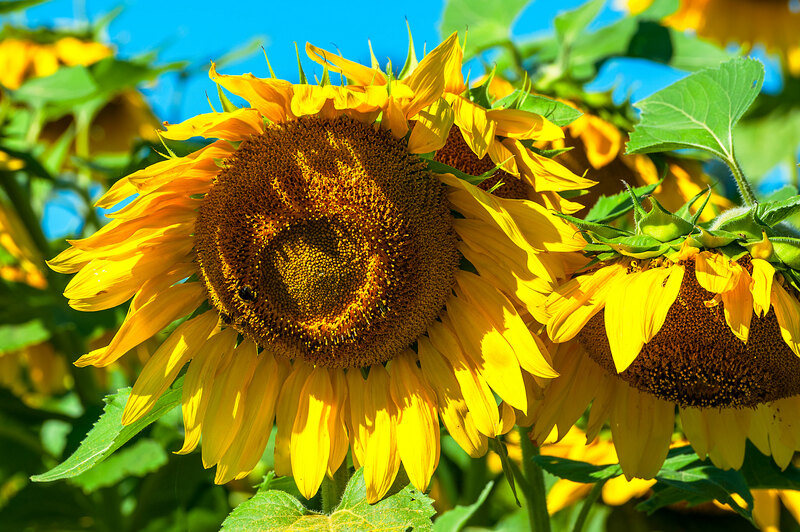 Nevertheless, I could not pass up the opportunity to see and photograph the sunflowers regardless of their condition, because it is not everyday that I am granted access to a private farm. Even if the sunflowers were wilted and damaged by the storm, it was going to be a perfect, cool late summer morning. 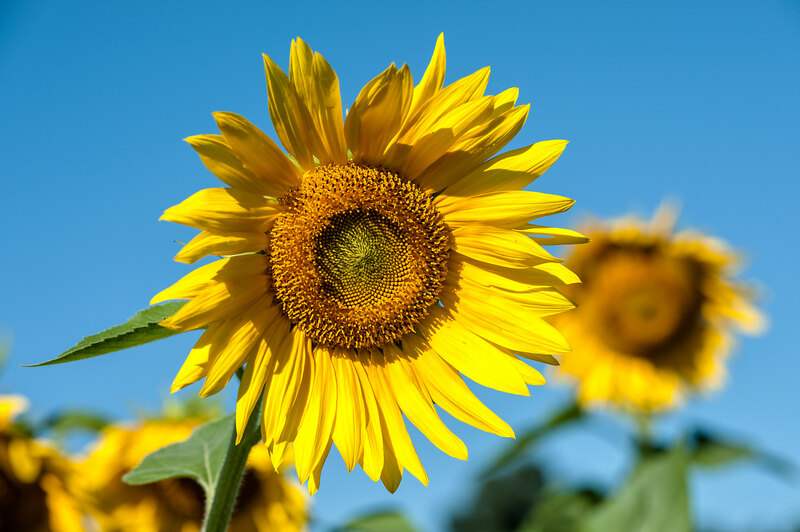 When I arrived at the farm and located the sunflower field, the sun had just risen and was lighting up the field of sunflowers, making their yellow and orange colors brilliantly glow in the morning light. My timing was perfect, and so was the setting. 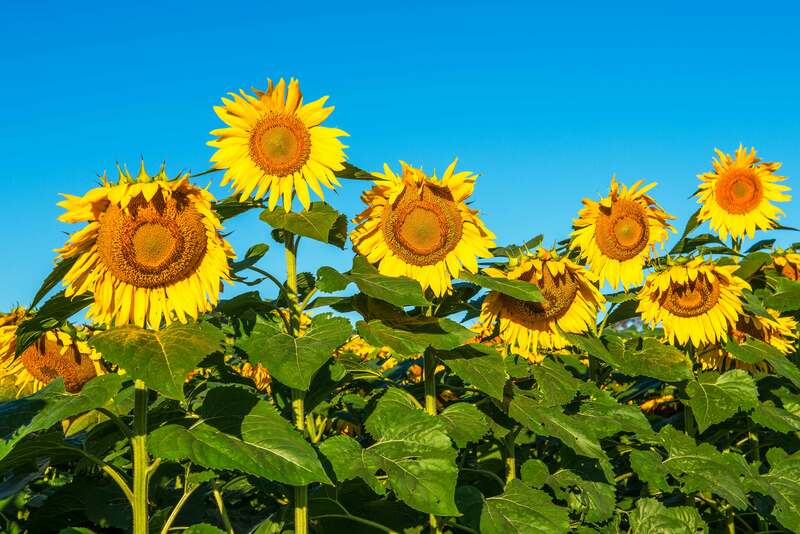 The sunflowers were located in a large field separated by a bright white fence and a large pond. The setting was breathtaking, and I was excited to be there. 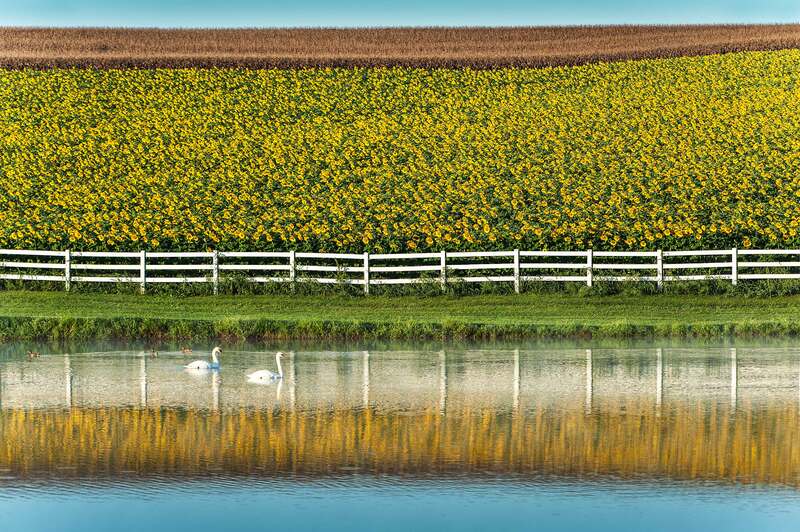 The view of the sunflower field from where I was located was made even more beautiful by the reflection of the sunflowers in the pond, and making it even more picturesque, were two swans that swam across to the other side, as I approached. It seemed as though they were posing for me by aligning themselves in the frame. As I walked along the field of sunflowers, I did see a few “late bloomers” that were standing erect among all of the others. I photographed as many of them as I could. A couple of those images are above and below. In addition to photographing the sunflowers, I took a few videos, one of which is below. If you make the video full screen and turn up your sound, you will better experience what I did that morning–tranquility, solitude and breathtaking beauty! Obviously, if I had been there earlier in the week, it would have made a difference, but it did not matter, because I spent over three hours wandering around admiring the beauty of the flowers and thoroughly enjoying the cool morning. 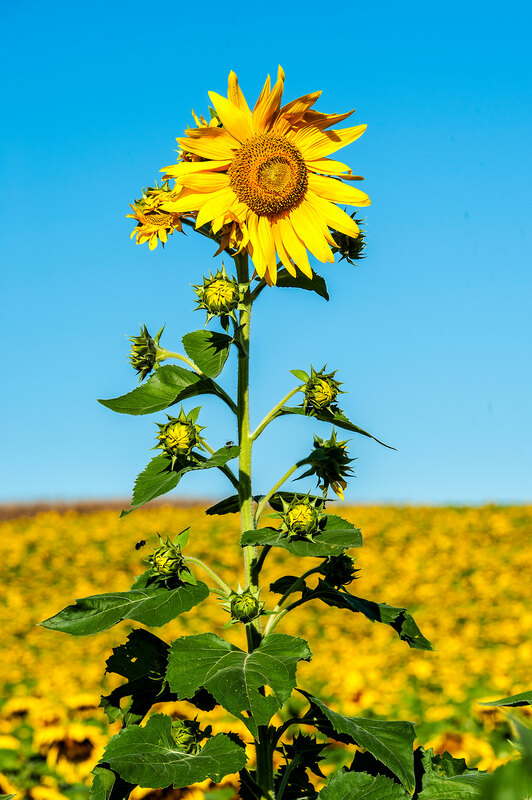 The below sunflower not only stood tall above the others, it was not wilting and healthy, had withstood the evening’s storm, and had an unusual number of flower buds growing from its stalk. It was one wild and crazy sunflower! There always has to be one that stands out in the crowd. In closing, I want to send my sincere appreciation to the owner of the farm that invited me to enjoy and photograph a little of the beauty that she enjoys daily. For the photographers that follow my blog, the images and video in this article were taken with a Nikon D800 and Nikon 24-70mm lens. The opening panoramic image is a composite consisting of 9 images that were “stitched” together in Photoshop 6. The original TIFF file was 2.3G, which was significantly reduced in size for this article. Nevertheless, click on the opening image to see the detail in this high resolution composite image. This entry was posted in Landscape Photographs, Nature, sunrise and tagged field of sunflowers, sunflowers. Bookmark the permalink. Ah! Sunflower, weary of time. Last year I had a chance to go photographing sunflowers but not this year. 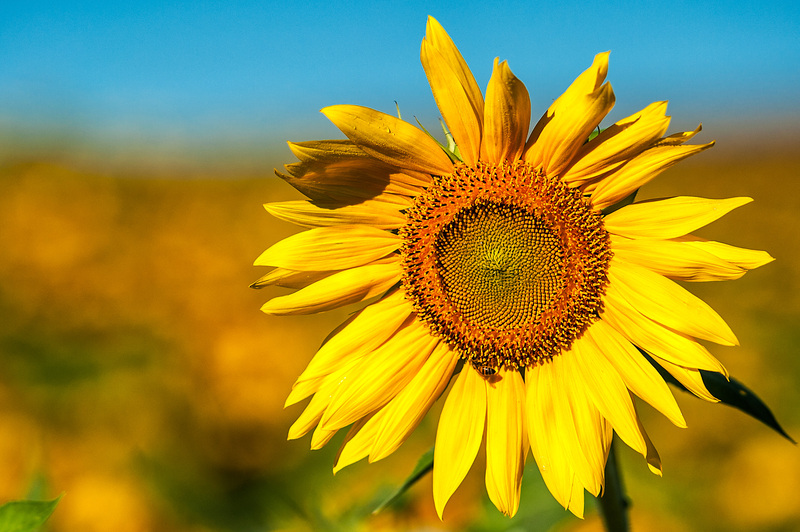 I am so glad to see those beautiful sunflower pictures from you. The opening panoramic image is just wonderful indeed. That video clip is also really cute. I feel the breeze. I am inserting my favorite poem by Blake for you and your readers! BTW, where is this place? Jarrettsville, MD? Thank you for poem Kee; I enjoyed it. And am glad you enjoyed my sunflowers. I very much enjoyed seeing yours. I love these photos, Stephen. The swans make the lovely pano even more beautiful. I loved the video too! Thank you Karen. Glad you enjoyed them. I certainly did. Sooooo beautiful!!!! 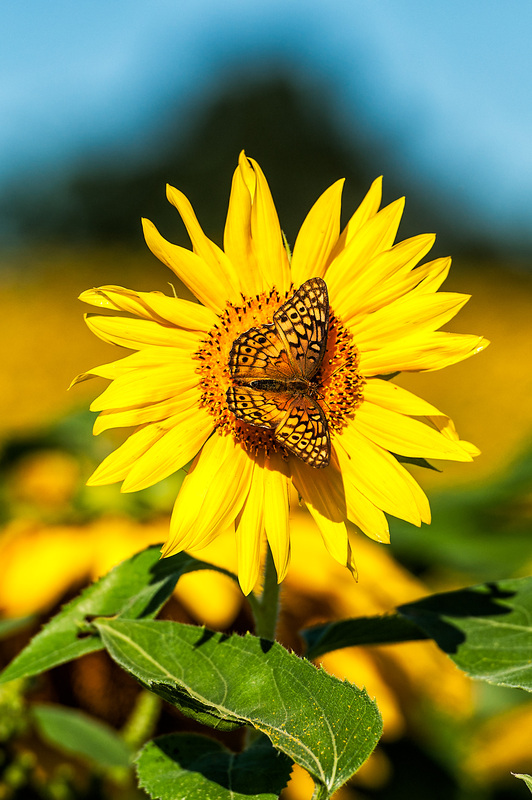 I love sunflowers and you captured all their majesty! The colors of the sky, the flowers, and the water are simply gorgeous!!! The video clip was a great addition, too! I envy your forays with natuare! Although I tried to capture the beauty of the sunflowers, they do not justice to experience of actually being there on such a perfect day. A wondrous sight to see. Since it would be too far for me to travel to see, I’m glad for you sharing for the rest of us! Beautiful! 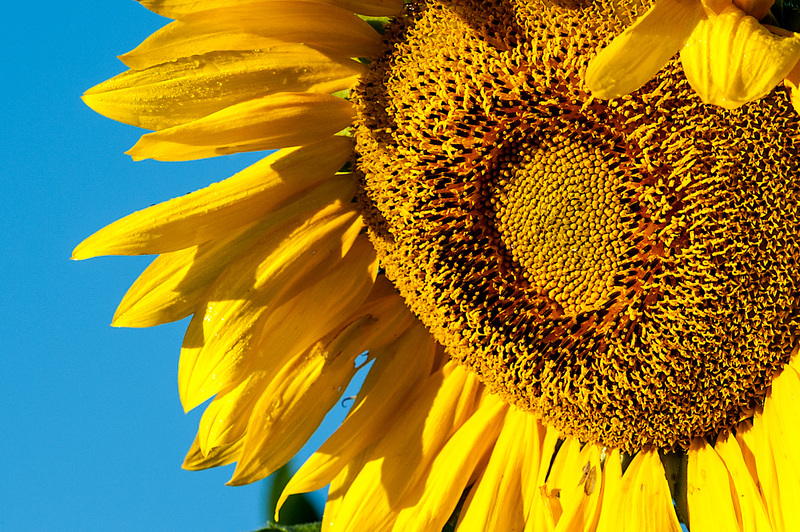 It was a beautiful sight with the early morning sun illuminating the sunflowers, which were all facing toward it. Sharing that sight with you and others makes it even more enjoyable. You have a great ability to capture the beautiful nature! I love the color of picture. The best thing that I love is the video. As watching the video, the wind, the flower, the bee etc. relaxes me, and it feels like that I am there, too. Thank you for sharing the photo. 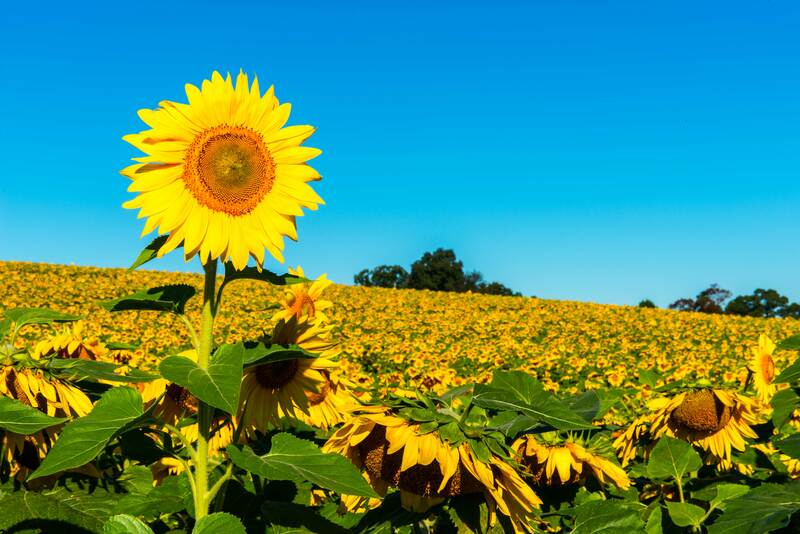 May I ask a favor to use the big sunflower photo for my background of a resume? Thank you. Yes. Send me an email, and I will send you a high resolution image file. Thank you so much! My email address is borakim90@gmail.com I really appreciate your kindness! Hello Stephen, My name is Joon. Especially the tall one with buds, and the butterfly one. Could you let me use your pictures to canvas print and hang on the wall, to make my living room brighter? Yes, Joon, you can. If you email me directly, I will send you a high resolution image.